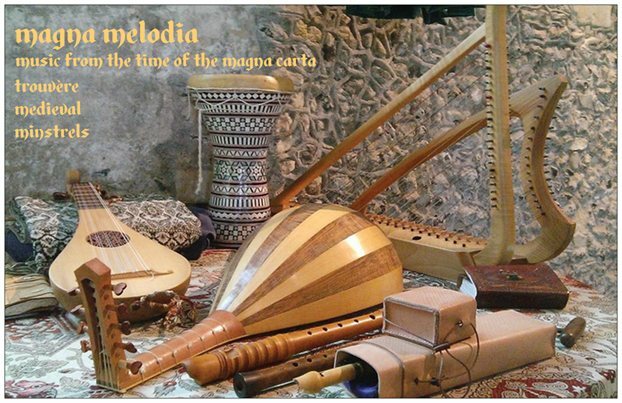 At Trouvère Towers, we have been very busy for the past six weeks or so on our new CD, Magna Melodia (of which more news very soon), but i am now able at last to return to the subject of our major new event for next year – Medieval Music in the Dales. Steve Tyler and Katy Marchant, Gaita Medieval Music, Sarah Fuhs, Leah Stuttard, De Mowbray’s Musicke, A Merrie Noyse Minstrels, Merrie Din, Claire Hannah and Capriole, Graham Wright, Maranella, Tom Hughes, Richard York, Charlotte Ewart, Lizzie Gutteridge with some or all of Blondel, the York Waits and the Colchester Waits, Vagarem, Waytes and Measures, Slag ende Stoot, Clare Goodall, Roughe Musicke and Le Caste Nymphe. We have also had nice interest from luthiers, including George Stevens (to be confirmed), Benjamin Simao Trinox Samoni, Jean-Daniel Talma of Atelier Elbock, Eric and Jane Moulder, and Alberic’s Workshop. Lizzie Gutteridge will also be selling her incomparable rommelpots, and we hope that more instrument makers and other suppliers will join in as word gets about. 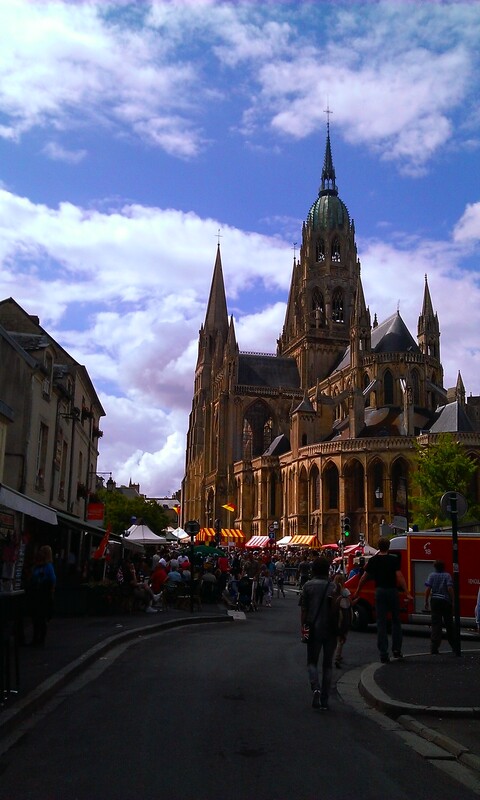 Likewise, we will be on the lookout for great traders for our medieval market. There are some tempting prospects for workshops – beginners’ bagpipe from Tom Hughes, more advanced hurdy gurdy from Steve Tyler, medieval dance from Charlotte Ewart amongst others, medieval harp with Leah Stuttard… We shall be returning to ask for preferences on workshops in due course and all ideas are welcome in the meantime. 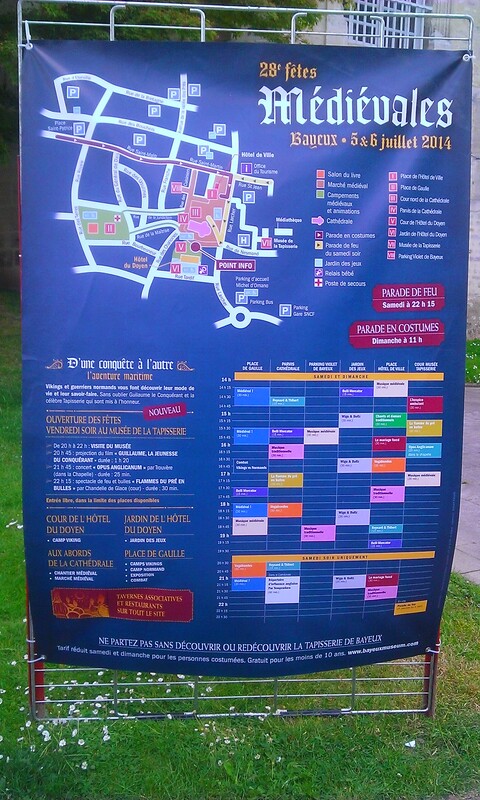 It looks very likely that we will have the use of St Oswald’s Parish Church at least on the Saturday. 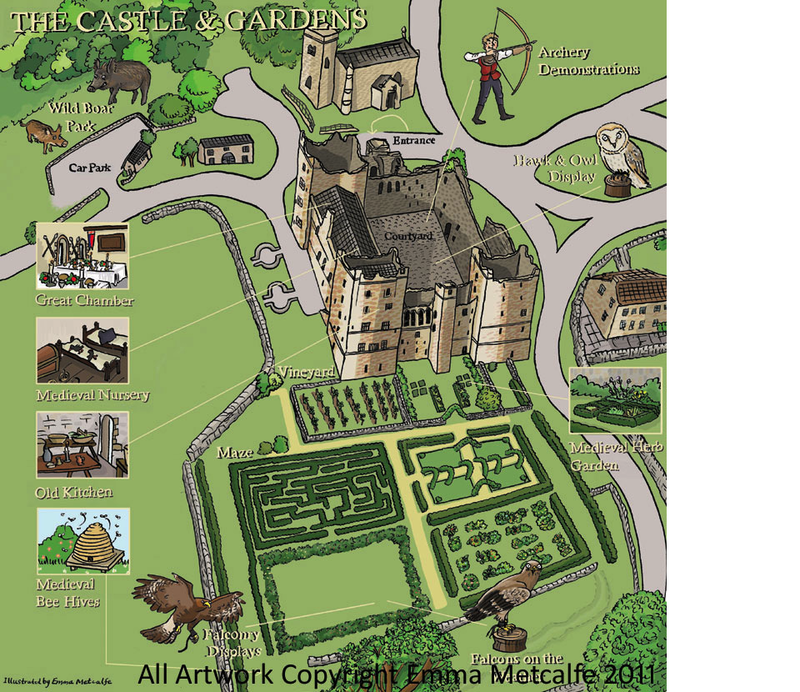 This is a great medieval setting standing in the shadow of the castle – a fourteenth century church contemporary with Bolton Castle and a lovely intimate space for concerts. 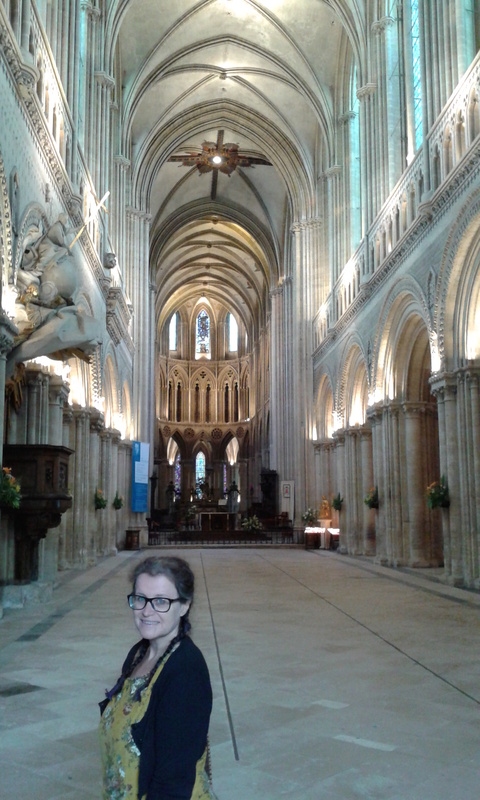 What do we mean by medieval? 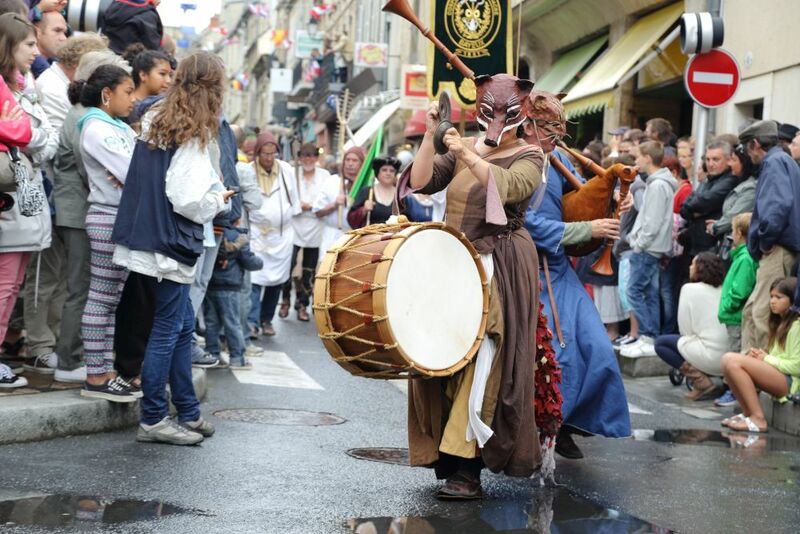 no ‘everyone thinks it’s medieval so it would be a shame not to’ – you know what we mean, no Greensleeves! 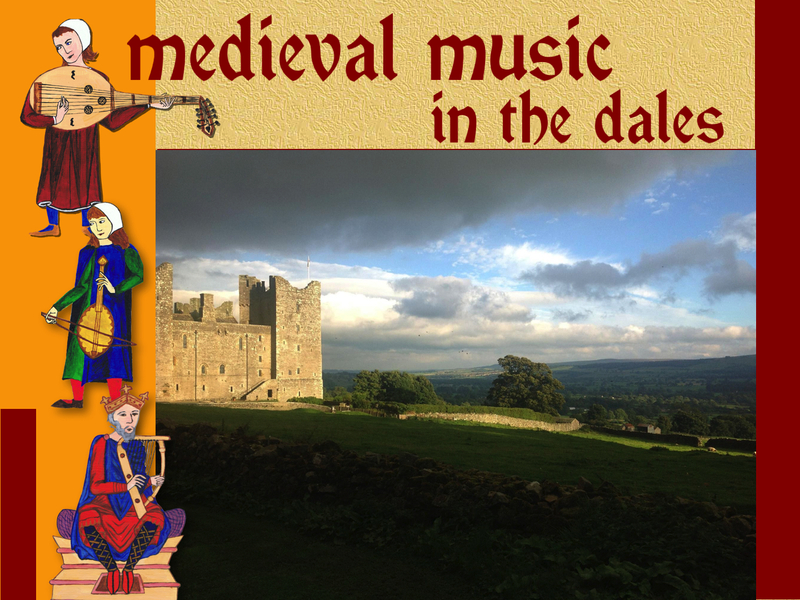 No one’s going to come and throw a band out for playing something 16th century, but we really hope that everyone will keep these guidelines in mind, and that way Medieval Music in the Dales will offer a uniquely medieval musical experience. 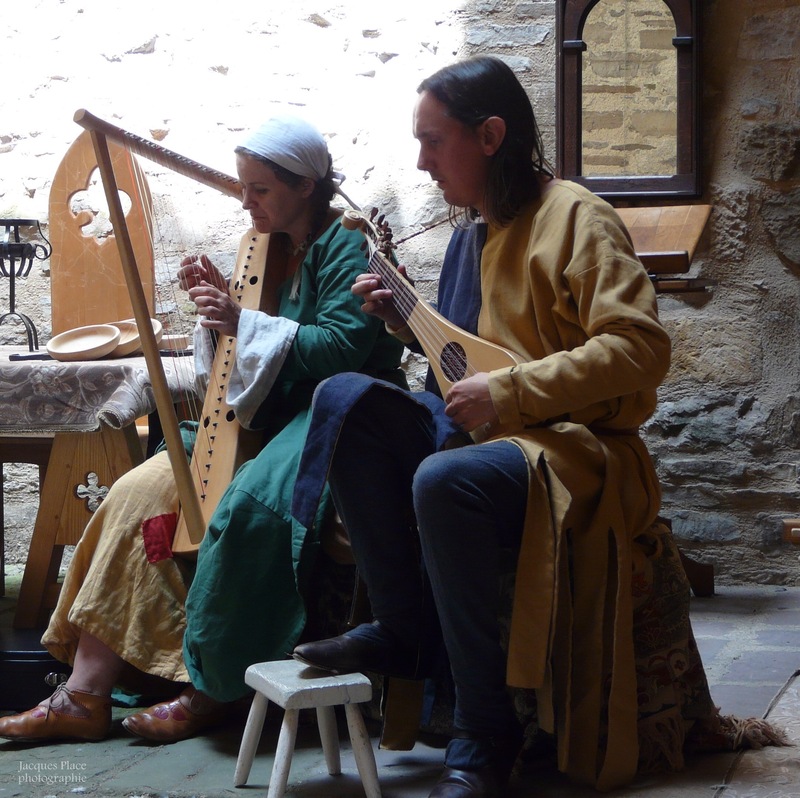 It’s already clear that there will be wealth of quality replica medieval instruments on show and in use at MMITD, and it’ll be great to hear their particular qualities. 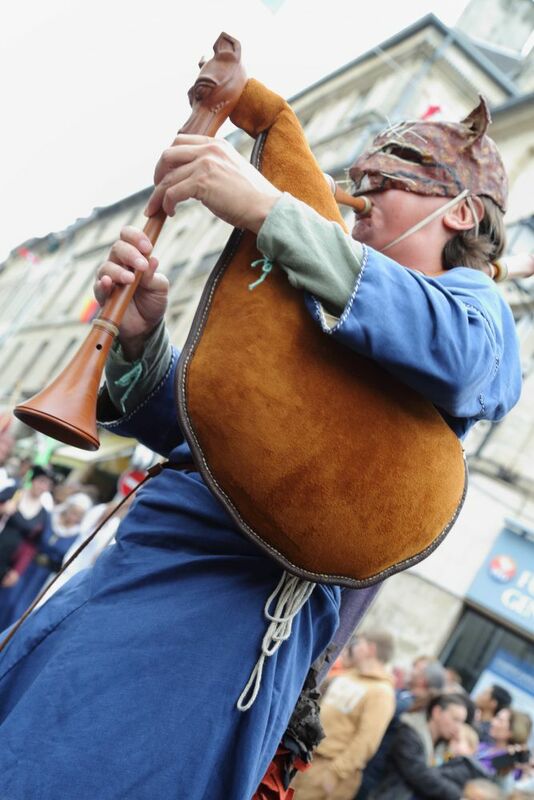 We encourage the use of medieval instruments at MMITD, but it is not a hard-and-fast rule as we know many people enjoy playing excellent medieval repertoire on more modern instruments. That said, we’d rather avoid any bowed psalteries… no, seriously, the most important thing is that the material played should be medieval in origin. 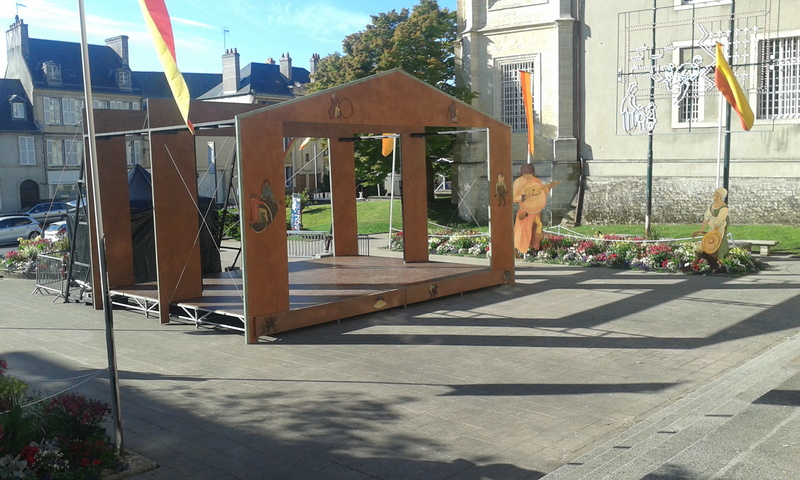 We are intending to apply for arts funding to cover some of the key elements of the event and this application will be submitted this autumn, once a firmer line-up of key performances and workshops has been settled. In the spring of 2016 we shall be starting a crowd-funding appeal to supplement this funding and this will also be a vehicle for buying advance tickets. More on this in due course! I’ve been working on the cover image for the new CD. 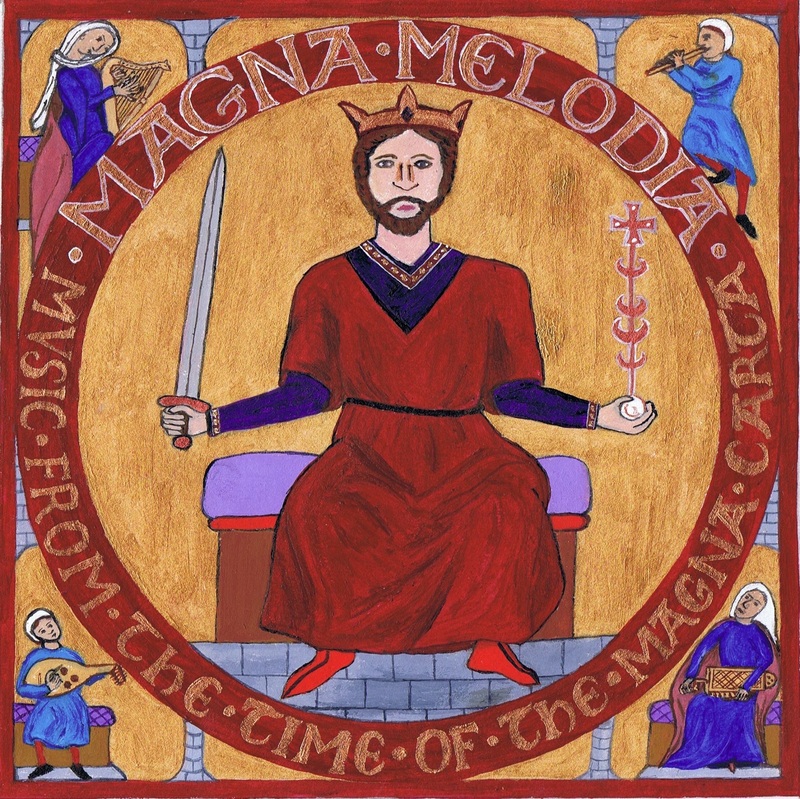 I wanted something that suggested ‘Magna Carta’ but also something that emphasised music. So this is what I’ve come up with. On John’s royal seal, the image is surrounded by the words Ioannes Dei gratia rex Anglie dominus Hibernie, in other words’ “John by the grace of God king of England lord of Ireland”. I’ve replaced this with the name off the CD! using letters modelled on those in the seal. So that’s the Magna Carta angle. 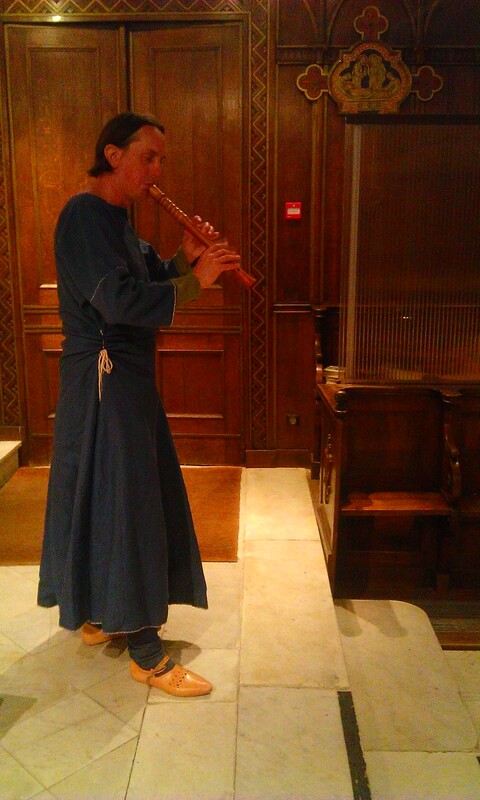 For the musical side of things, I thought I might echo the many medieval images of King David, the great biblical musician. He is often shown (usually himself playing an instrument) surrounded by other musicians. So I snuck in images of a female musician playing a harp in the top left and a symphony on the bottom right (representing me!) 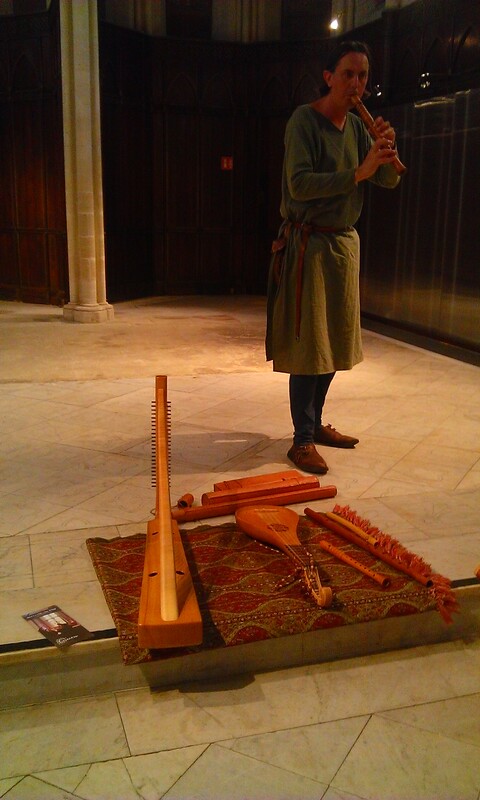 and a male musician playing a duct flute in the top right and a medieval lute in the bottom left (representing Paul). All four of these images are loosely based on medieval exemplars. The harp player is based on the King David in the Westminster Psalter – the same image upon which Eric Kleinmann based my wonderful new Romnesque harp – while the symphony player is based on the famous miniature in the Cantigas de Santa Maria. The lute player is drawn from the Cantigas and also a couple of images in Alphonse X’s Book of Games, while the original of the flute player is a slightly earlier and English image. Having created the image, we will now pass it on to our splendid graphic designer, Matt Riley of fusion design in York to transform it into a CD cover with our logo and all the other details and packaging. Musically, things are going really well. Paul has been concentrating on the troubadour material and has been recording the first instrumental pieces. 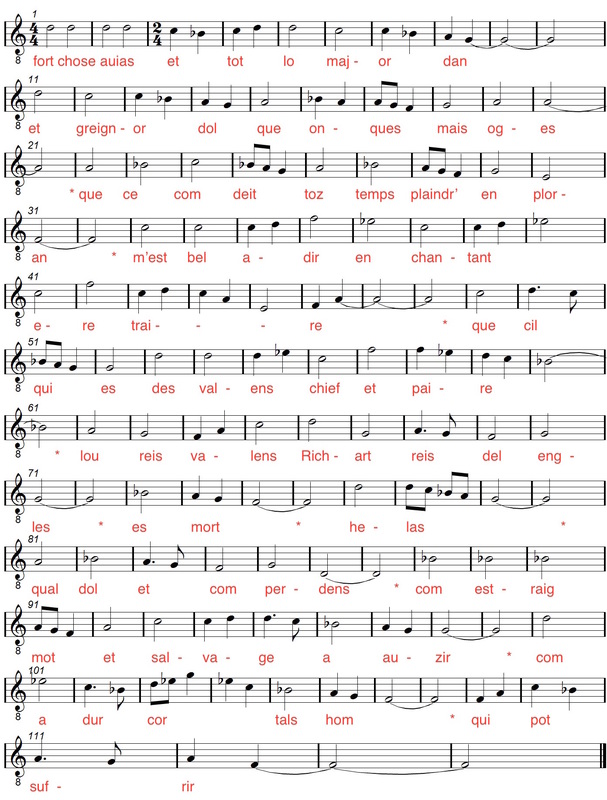 I’ve been working on the pronunciation for ‘La dousa votz’ and ‘Voulez vous que je vous chant’ – those pesky differences between Occitan and French are testing me! We’ve decided to include Raimbaut de Vaqueiras’ Kalenda Maya (in an instrumental version) and the melody sometimes known as the English Dance. This comes from the same manuscript as Foweles in the Frith – Douce 139 – and so is right at the end of our period. 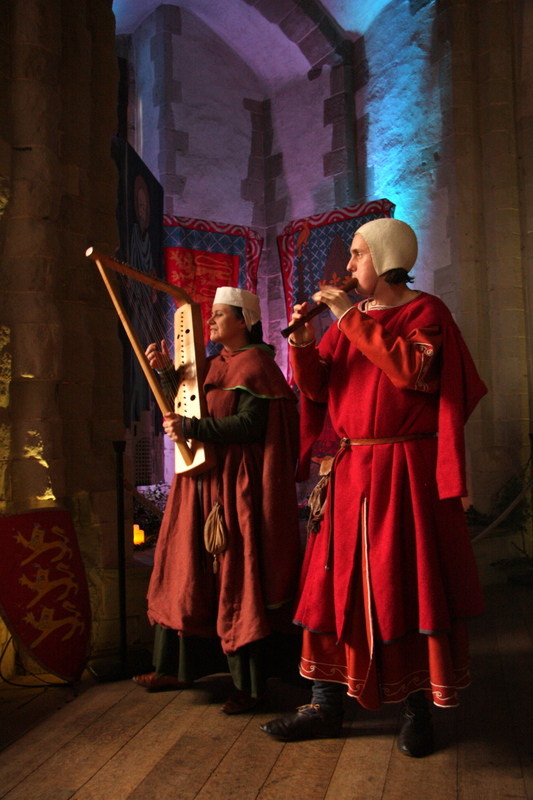 Soon we will be turning to the Sicilian repertoire, which being largely Christmas tunes and also twelfth century, will also play a large part in our music for the Norman Christmas event at the Tower of London (27-31 December), and our ‘Medieval Christmas’ concert at Barley Hall in York (18 December). 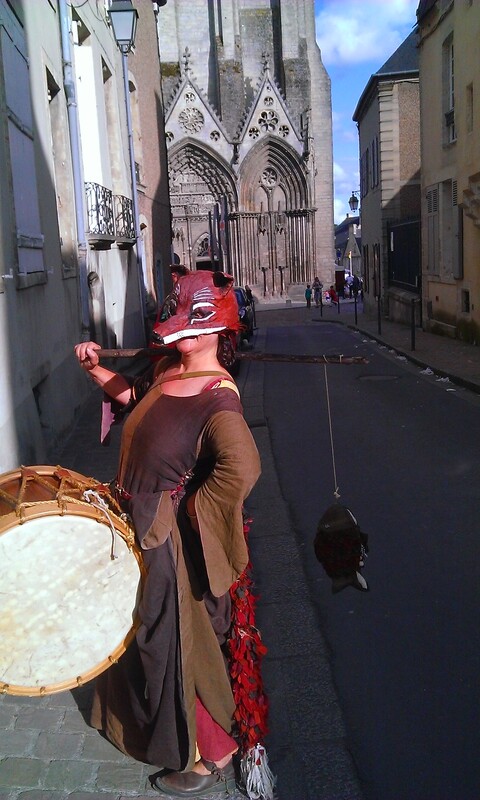 Browsing Facebook as one does, a few weeks ago, I came across The Manuscript Challenge and was instantly seized with enthusiasm to take part… It’s a simple enough idea – choose a specific medieval image and recreate the costume (one or more as you wish) portrayed therein. There are few rules and none on authenticity per se, but it seemed to me to chime with the desire to go right back to the sources in reproducing outfits and hopefully thus going some way towards eliminating some of the costume myths that have grown up. 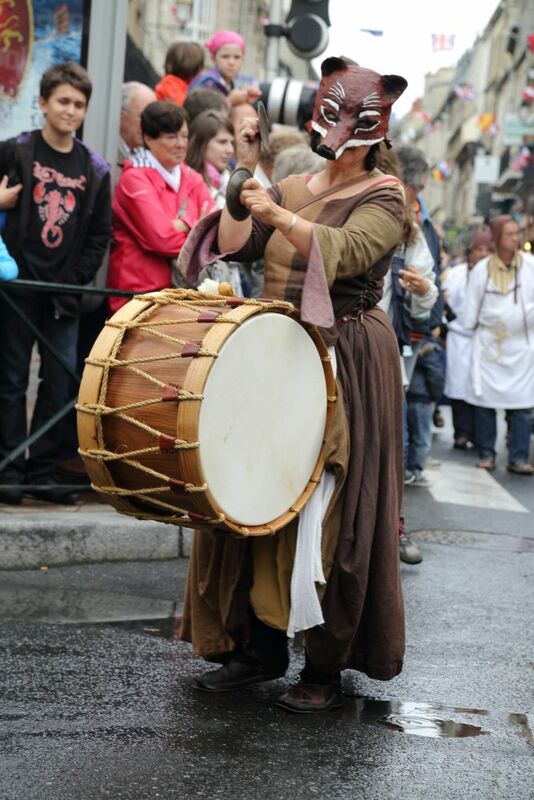 I was wanting anyway to make myself an early thirteenth-century outfit. 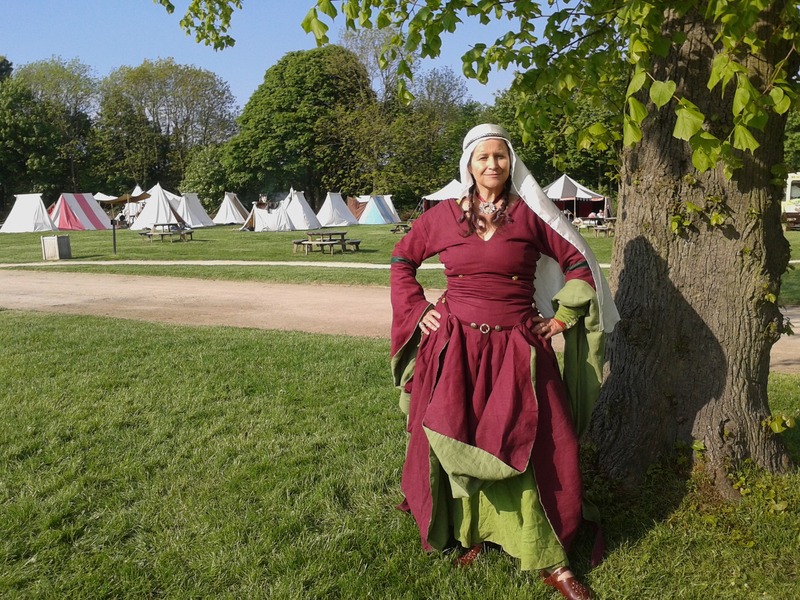 I have a wonderful twelfth-century outfit, courtesy of Vicky Bayley (Aquerna Fabricae) and have made a similar period bliaut for Paul, which I am really pleased with. 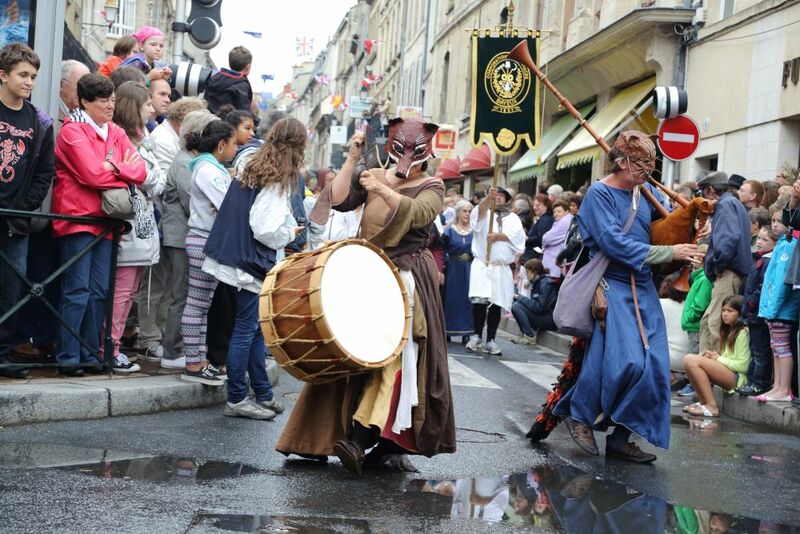 Here we are looking all twelfth century. As you can see, there were a couple of images that I used as inspiration for Paul’s bliaut. However, as we are working on a Magna Carta programme and going to be involved in several commemorative events for the 800th anniversary in 2015 I thought we needed to have good thirteenth-century apparel as well. As usual, Paul is better equipped already… I made him this embroidered cote (left) a few years ago. It’s based on a manuscript image from c.1250 and I think will do well for the first half of the thirteenth century. As you can see from Paul’s two outfits, there is quite a change from the twelfth into the thirteenth century. In the earlier period there was a great emphasis on tight fitting, with body shape revealed and emphasised with cut and lacing, but this disappears by the start of the thirteenth century. Now the cut is loose, even baggy, with the excess material belted in or simply left loose. I have to say that I have not found this thirteenth-century look the most flattering cut for the more ample figure… and although I have made myself suitable outfits before I have never really liked them. So I am determined to do better this time and make myself a stunning outfit in the height of early thirteenth-century fashion that – crucially – I actually won’t mind wearing! a loose, very full, and full (or longer) length under dress. This is often but not always in white and may be a shift. The sleeves are tight and long, being wrinkled back up over the wrists. It’s not possible to see the neckline. 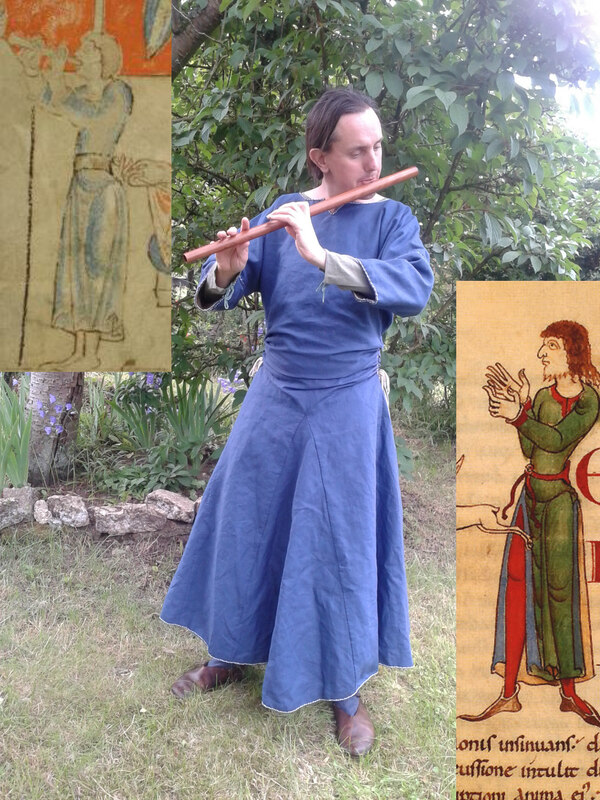 an overdress that is quite tight in earlier images but much looser in later ones – I will be going for the loose look as more thirteenth-century. 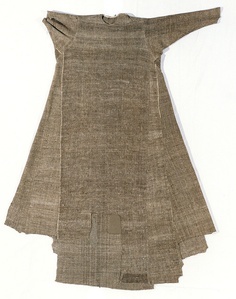 This overdress is not full-length; it varies from just below the knee to just above the ankle and at all times the fuller and longer underdress is visible underneath around the ankles and feet. This overdress has three-quarter-length and baggy sleeves and is usually but not always held in with a belt. 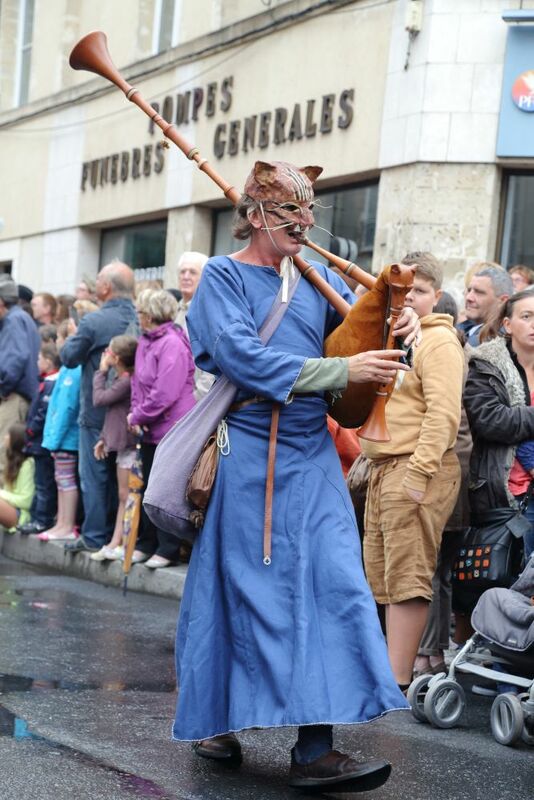 Again, belts become more typical into the thirteenth century. a simple rectangular veil usually quite loosely wrapped around the head. This is the image that I have selected as my core image for the Manuscript Challenge. 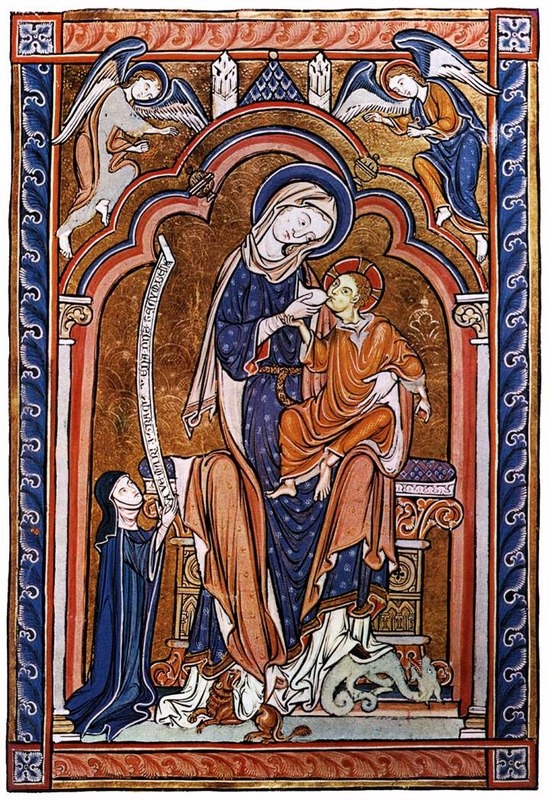 It is a portrayal of the Virgin nursing the Christ child (the Madonna lactans) and comes from the Amesbury Psalter, dating from around 1250. I was particularly drawn to this image because of the gorgeously decorated blue textile, which I’ve taken to calling ‘starry starry night’. 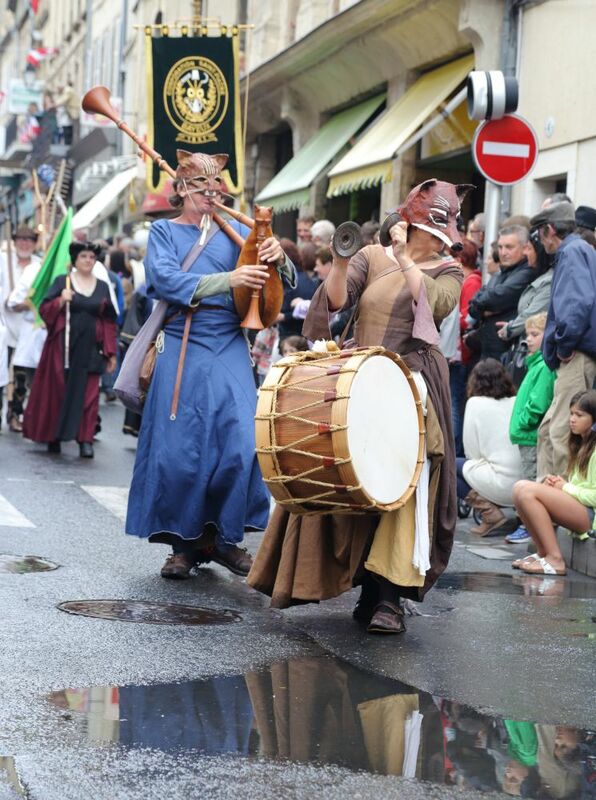 It’s a design that is quite often seen – again, my Pinterest has gathered several examples from the twelfth through to the fourteenth century. 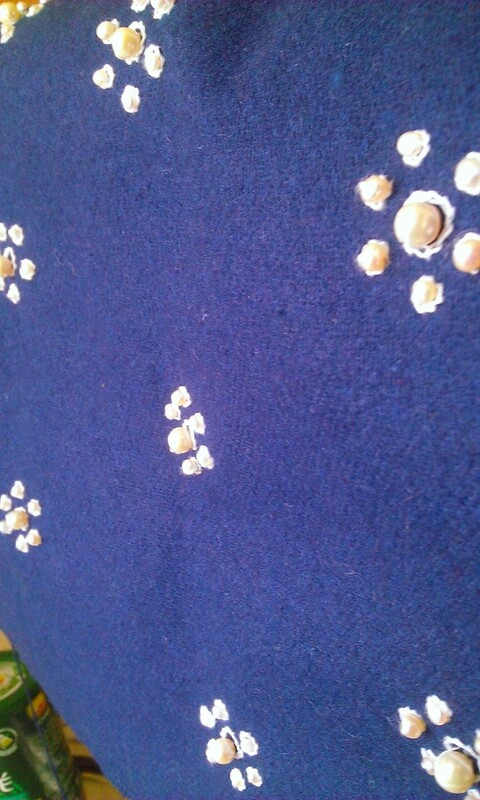 I have been considering how to replicate ‘starry starry night’, and have decided to go with pearls supported by white embroidery. 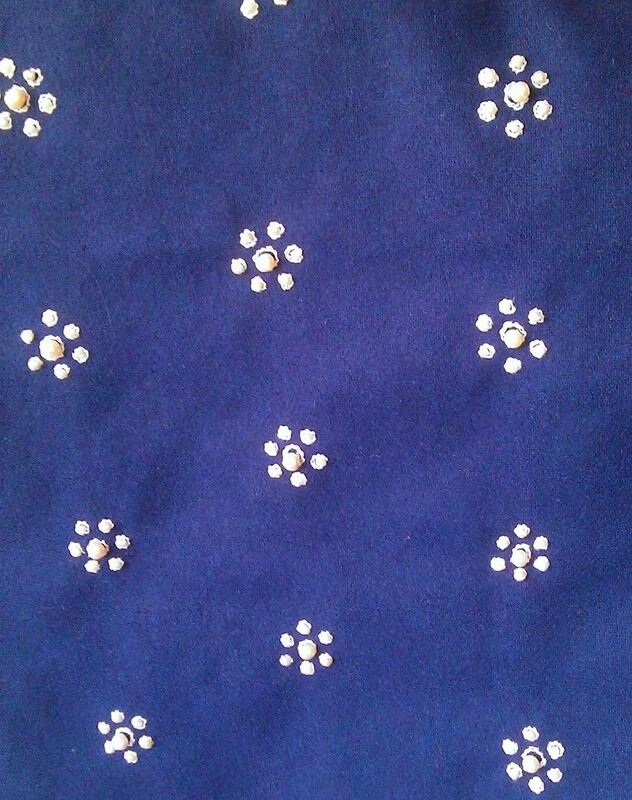 Pearls are often mentioned on garments – for example Chaucer’s “of perles white were alle hise clothes broded”. This will be considerable labour, but I think will add considerably to the grandeur of the outfit. The conditions of the Manuscript Challenge dictate that I must replicate the design of the dress for a nursing mother. I have already received helpful advice from other seamstresses on the Challenge. 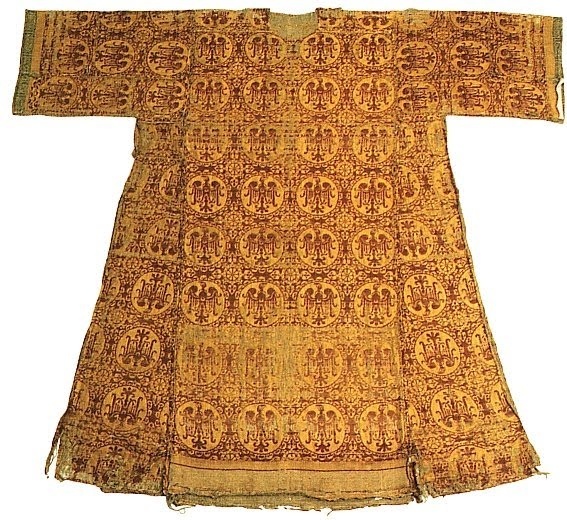 Moreover, having examined surviving garments, I have decided to use the gown of St Claire and Empress Matilda’s tunic as my models, both of which allow for side gores going all the way up. This should allow for an open seam above the breast which could either be subsequently sewn up or simply concealed in the bunching of the fabric. I have now acquired most of my materials and have begun with the underdr ess (left) – just completed, and made from a vintage medium-heavy linen sheet I bought in France a couple of years ago. This underdress is very long (just over full-length) and nicely full, with a hem circumference of around three yards. I may end up shortening the underdress for practical use! For the overdress I have a lovely Italian blue wool and this dress will be lined in red linen. I have some lightweight white linen for the veil, left over from a previous project. I have a length of red wool for the mantle, which I will hopefully be able to line with the remainder of the underdress linen. l still need to decide on what to use for trimming the overdress and the veil – I have some silk/wool material I may use. For the belt I have various possible lengths of braid. 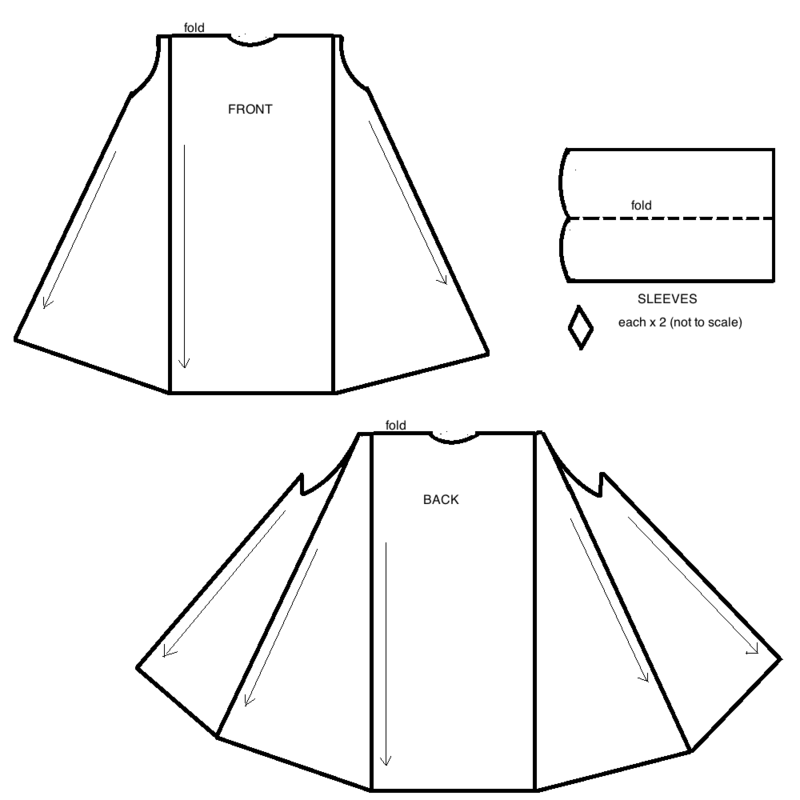 I am about to start piecing the various parts of the overdress – I intend to mark out the pieces on the fabric and do the embroidery before the cutting, avoiding embroidering any material that I don’t actually need to use! I shall post images of the overdress in progress as it goes along.